Despite being based in London, Ajam developed many of the tracks for ‘Rag O Risheh’ whilst on tour performing their repertoire across North America, Europe, the Middle East and North Africa between 2012 to 2014. The source of other tracks such as ‘Tayyebeh Jān’ come from research and study trips to Iran involving field recordings of regional music masters. The songwriting and lyrics are predominantly by Amin Ajami and Arash Fayyazi with regional poems and extracts from classical poets being utilised in some choruses and bridges. The arrangement has been credited as a combined effort by Ajam. Nariman Akrami and Amin Ajami executed the production of the tracks with Nariman’s focus being on synthetic and electronic elements of the soundscape and Amin’s forte being predominantly acoustic components of tracks. The mixing of the album was carried out Nariman Akrami with some of the acoustic-dominated tracks benefiting from mixing by Tom Sullivan. The album was mastered in the old established Bārān Studios in Tehran by the seasoned engineer Ramin Mazaheri. The album includes several guest musicians including Kaveh Sarvarian (Ney and Tombak), Soroush Omoumi (Drums and Percussions), Arsam Babaei (Kamalin, Kamancheh, and Percussions). Guest vocals are provided on Tracks 12 and 13 by Mehdi Boostani, an old-time friend of Ajam’s, who usually assists in recording and performing songs that require vocal tone and styling relating to the foothills of the Zagros Mountains, Iranian Plateau and Fars Province. As mentioned above, Track 10 – ‘Tayyebeh Jān’ took shape through several research trips made by Amin Ajami to the Alborz Mountains region and the Province of Māzandarān. The track was compiled through the tuition and help of Jamal Mohammadi (a master of regional music and the founder of the Kayer Ensemble) and his family. Whereas in the majority of Ajam’s tracks they have sought to perform and record their instruments with the relevant regional accenting/ornamentations, ‘Tayyebeh Jān’ incorporates a high level authenticity with genuine Māzandarāni instrumentation and vocals being provided by Jamal Mohammadi (Vocals and Kamānche), Kamal Mohammadi (Vocals), Narges Mohammadi (Backing Vocals), Ebad Mohammadi (Vocals), MirHamzeh Mohammadi (Backing Vocals), Jamileh Mohammadi (Backing Vocals), Mohammad Mohammadi (Lalevā – Shepherd’s Reed), Ali Mohammadi (Dosar Kotan – Double headed clay drums). Significantly, this track involves an appearance by AlbolHassan Khosru a veteran maestro of Māzandarāni vocal tradition. 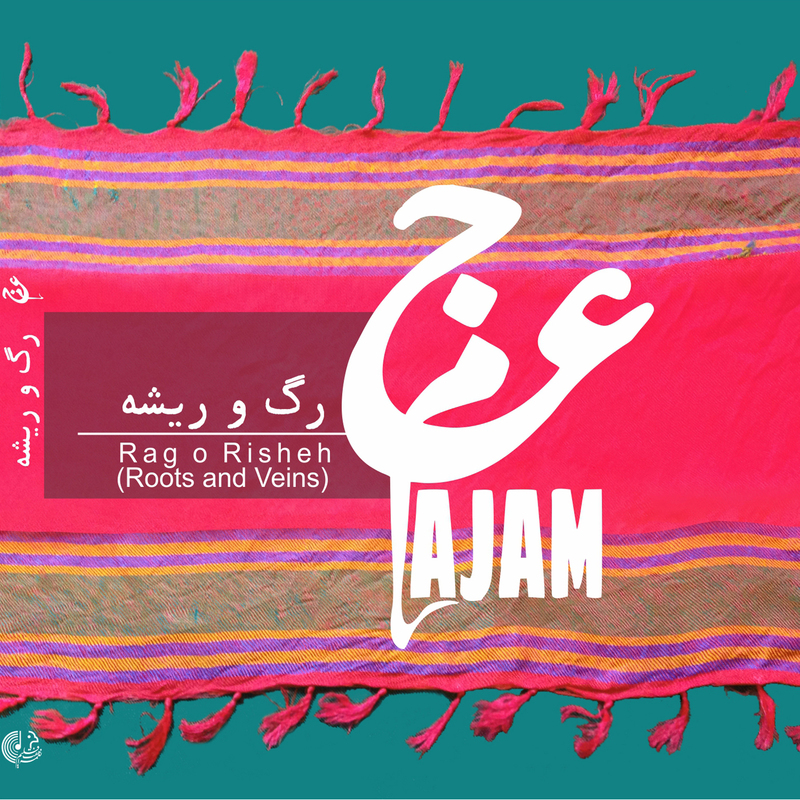 The album artwork comprises a red Dastmāl Yazdi (a traditional shawl/kerchief with various applications including rituals relating to traditional sports and as part of ceremonial dances – also referred to as Dastmāl Kāshāni by some) with the decorational knots at either side of the Dastmāl representing the roots and veins bleeding into the green background. The album design was compiled by Tehran-based graphic artist Reza Yazdani. The inside sleeve of the album design incorporates a photograph taken by Pouya Bani Eghbal portraying the core members of the Ajam Family.